This review first appeared in the May 4, 2008 issue of the North County Times. It's not a simple matter to deffine exactly what Steven Pressfield's latest historical war adventure is. "Killing Rommel" isn't literature, but it is literary. While definitely a military book, it is surely more  much more  than just another war tale destined for paperback best-seller status in a year's time. There is philosophy galore to be found in these pages, and loads of real history, both wrapped around what one of Pressfield's characters might have called a cracking good yarn. 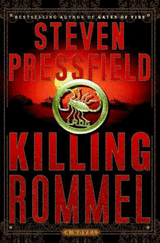 But Pressfield's most impressive achievement here isn't crafting a story of British desert rats in early World War II trying to sneak behind enemy lines to assassinate Germany's most effective general; rather, it's in creating characters of true substance, characters who, though fictional, in these pages are as real as the historical figures with whom they mingle. By the time you're into the second chapter, R. Lawrence "Chappie" Chapman will seem as flesh-and-blood in the reader's mind as Erwin Rommel himself. Pressfield brings his characters to life through the small details of daily life. It is in his descriptions of what it was like to drive massive Chevrolet trucks through the North African desert  of how the motors sounded, the silence of the nights, the feel of the wind on one's face  that makes you forget this is make-believe and not real history. Clearly, Pressfield has done his homework on what it was like to have fought in the North African campaign (a point borne out by the list of folks he thanks in the book's acknowledgments). The book moves quickly, despite the detailed observations, because Pressfield has adopted the dry, clipped British narrative structure his imagined English protagonist might have had. It all adds up to a book that's hard to put down once you start, one you wish would continue once you reach the end.